This is is a follow-up article to a popular blog I wrote just a few years back (March 17, 2014). It was published on the New England Photographer's Guild website and titled "Litchfield's Laurel Ridge Foundation Daffodil Festival". Initially, my intent was to place some good light on a Connecticut attraction that has been popular with local Litchfield Hills residents for years. After a long winter and solid month of stick and mud season, everyone's ready to shake off the cabin fever and head to the hills. 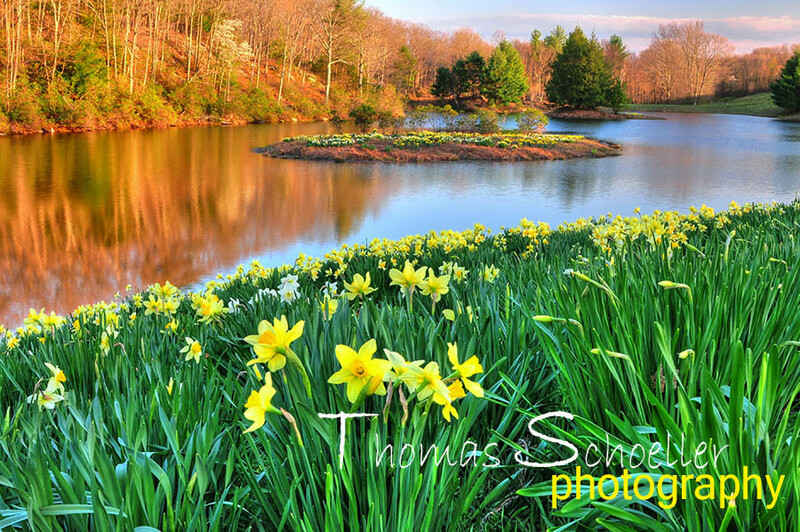 What could be better than millions of blooming daffodils on a beautiful rolling hillside and a pond? Since the first article published, I've been contacted on a regular basis each spring. Usually beginning around late March with inquiries from folks in outlying regions that know spring comes a little later in the NW corner of Connecticut. The common questions are "How are the daffodils progressing up there, Tom?" or "I'm headed to the Ridge this weekend, I'm 3 hours away. What do you feel is the best time of day to photograph?" I've found the vast majority of them are enthusiast photographers, excited as a box of kittens to get out there and photograph some beautiful Litchfield Hills scenery! I receive wonderful compliments from so many, inspired by my images from Laurel Ridge over the years and to thank me for writing such an informative article. I've decided it may be a nifty idea to become a go-to source for those that plan to photograph Laurel Ridge. I'll be updating the daffodil growth each year on my Facebook Fan Page beginning in late March (be sure to LIKE and follow) and I encourage those who LIKE my page to upload their best shots to my guest entries. To top it off, I'm going to provide this informal "Photographer's Guide" to photographing the Laurel Ridge Foundation daffodils. As you continue to read and scroll down, I'll be displaying a couple of my most popular images from the location, and provide some details and tips as to how I made the shot. Of course, I encourage you to explore other potential compositions while you are on location. The photo above is one I made dating back to early May of 2010. The time of day was after 6pm, allowing the sun to dip closer to the horizon. The late day lighting provided a beautiful, soft warm tone. The sunlight was just over my right shoulder, so this is a front lit scene that will not offer much difficulty with contrasty light and deep shadows. When I composed the image, I wanted to keep this simple while including the island in Ridge Pond. The background topography is not as stimulating or exotic compared to scenes from the American west, so I felt it was a necessity to include the island as the subject. Using the rule of thirds, I placed it to the upper right of the frame. Of course, a scene from laurel Ridge would be incomplete without bright daffodils.The challenge is adding another element to the scene without including TOO much. You'll need to use good technical skill to get sharp depth of field front to back. Here's how I managed that: I used a tripod, splayed the legs wide and lowered the camera body just inches above the height of the daffodils. I attached my 24-70 F/2.8 lens and shot this frame at about 30mm. I wanted sharp depth of field to make this work. You can use a hyperfocal chart to obtain the maximum depth of field. You want to be certain not to allow lens diffraction to soften the forest detail behind the island. Lens diffraction is a common ailment if you stop your lens down to tiny apertures like F/22. I set up about 28" from the flowers and focused on a flower about 7-8 feet from my lens. An aperture of F/11 did the trick, keeping things sharp from the focal point to the closest flowers and back to the evergreens beyond the pond. Photo tip: If I'm here when the light is "meh" I'll wander around without my gear and study compositions, then return on a day when the light is proper. 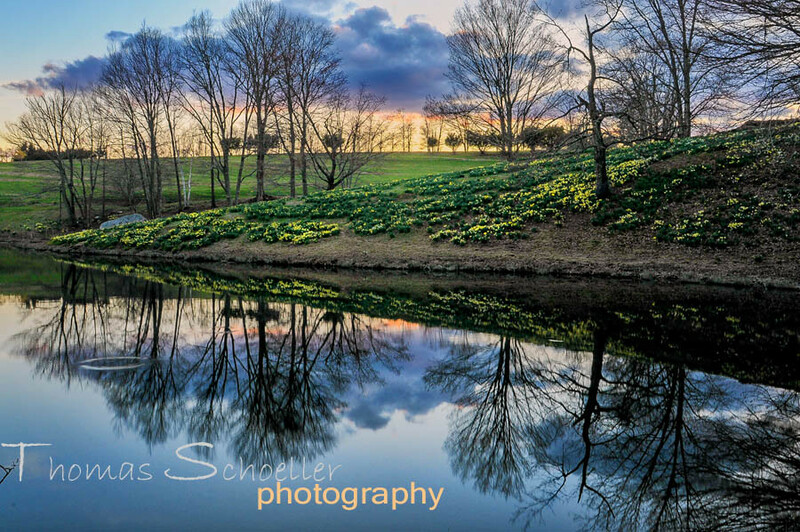 During one of those occasions, I discovered the converging lines reflected in the pond to form a tight horizontal < off the hill covered with daffodils It's shapes and textures that make your photo's stand out from the rest, providing a visual interest. For this scene to work, the slightest breeze will just kill it. Serenity rules when trying to capture a mirror-like reflection from a pond surface. I admit, I've seen prettier skies in my lifetime however the puffy clouds and warm tones on the horizon were complimentary and did not distract from the shapes of the mostly naked trees. Depth of field was not an issue with this image, I focused on the reflections in the pond many yards beyond the lens glass and captured the scene at F/13. If the sunlight was brighter, this would create a challenging lighting situation since the scene is backlit. I used a soft edge 2 stop neutral density filter (hand-held) just to hold back the brightest light in the sky. This allowed me to maintain the detail on the shaded hillside holding all the yellow flowers. Lastly, you may be thinking about trying a portrait or three? This is a great place to do so. The model is my 19-month-old niece (at the time) and I made this late-May of 2015. The winter of '14-'15 was brutal, February was the coldest on record and the snow was still 20" deep at Laurel Ridge in mid-March. The daffodil display peaked very late in 2015 thanks to the extreme and very long winter. The late day sun is something you can use to your advantage to make creative portraits. Here are a few pointers: Place your subject in front of the sun! I know, that's against everything you've probably ever heard before. That is exactly what I've done here, and take notice to the beautiful highlights on Chelsea's hair. 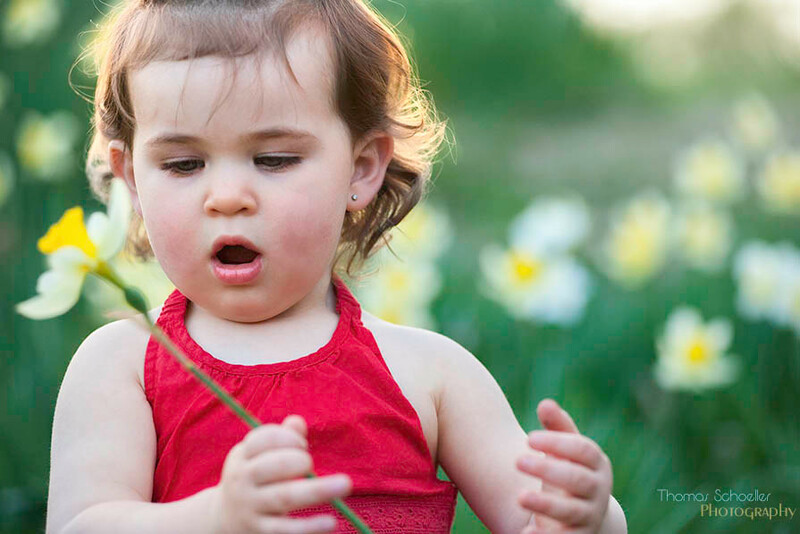 You'll want to set your camera up for aperture priority, and open it up to F/4 or F/5.6. For this shot, I used my 80-200 F/2.8 lens which provides buttery smooth bokeh (out of focus background) beyond 120mm. When doing a portrait, keep in mind if the background is sharp, the background is also a distraction. Landscapes and Portraiture are far removed from each other with regard to technique. Take note to the daffodils behind Chelsea, leaving them soft enhances the scene yet they are just sharp enough to identify them as flowers which adds to a cheery scene fitting for a young girl. I set the Nikon D3X body to spot meter mode, which allows you to get the correct exposure on the subject. Losing detail in the bright background is not important, in fact it's a better effect. I used autofocus for this series of portraits, and focused on her eyes and nose. Manual focus and a bouncy year and 1/2 old child never pair up well. Lastly, bump up the ISO to avoid blurry images. It was still quite bright for this scene, so ISO 800 worked well. If you have a continous shooting mode (burst mode) be sure to fire off plenty of images! Facial expressions change quickly on kids, if you wait to capture "that look" you won't nail the shot. Here are a few more random tips to make this an enjoyable place to make some nice keeper photographs. Ideally, the best time of day to shoot here is early morning (dawn to about 9am) and the late day sun and back-lighting opportunities are awesome well after 6pm during April and May. Plan on arriving by 5pm to get acquainted and think of scenes. If you arrive earlier, even better as it provides more time to plan. Mornings are usually very quiet, a great time to get some nice photos. The day of the week is also important. Not that Thursday is any better than Tuesday, I'm letting you know weekends are going to be pretty crowded. If the weather is great, a Friday evening will draw quite a few folks as well. If lot's of people in your photos is something that is not appealing, try to plan for a mid-week visit. The terrain is not a deal breaker, so a light pair of hikers will work fine. The closer you get to Ridge Pond, you assume the greater risk of wet feet. Garter snakes are fairly common, especially near the stone wall fences. Spotting them will require patience and keen eyes. They are very timid creatures. Laurel Ridge: how to get there? It's located in Northfield, Ct. and is just off Route 254. If you are driving from Litchfield (Rte 202/118) you'll be watching for Wigwam Road on your right. It's several miles from Rte 118. The address for your GPS unit is 66 Wigwam Rd. Enjoy your visit! Please be sure to Follow and LIKE on Facebook.